We were born there in the parish of the Cerro, one of the many neighborhoods of Havana. The background: The Circle of the Cerro. Then something more formal, The Circle of Cuban Christian Thought. 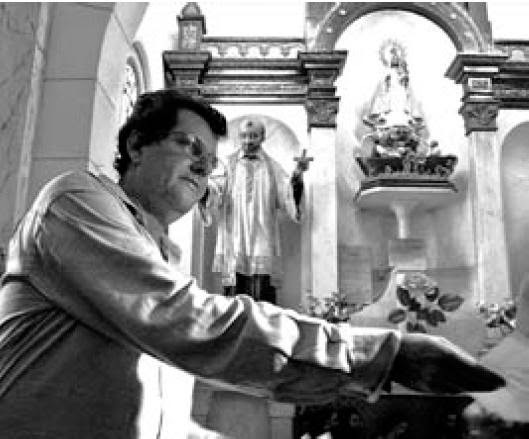 This was banned and dissolved when it launched the first free Cuban publication, also prohibited, titled "People of God", proclaiming the source of liberation: when we said, "We must obey God before men", "Render to Caesar what is Caesar's and to God what is God's, "But if God gives you Freedom, who is Cesar to take it away? "All men and women are my brothers and sisters." "We will not act violently or submit to violence," "You are my brother, I do not hate you, but I am not afraid of you." 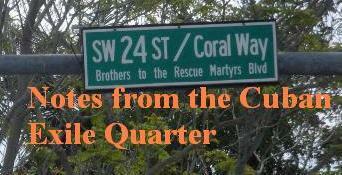 Since 1961 in Miami the feast day is also celebrated on this day. Tonight at the University of Miami's Bank United Center, Archbishop Wenski presided over the Mass. 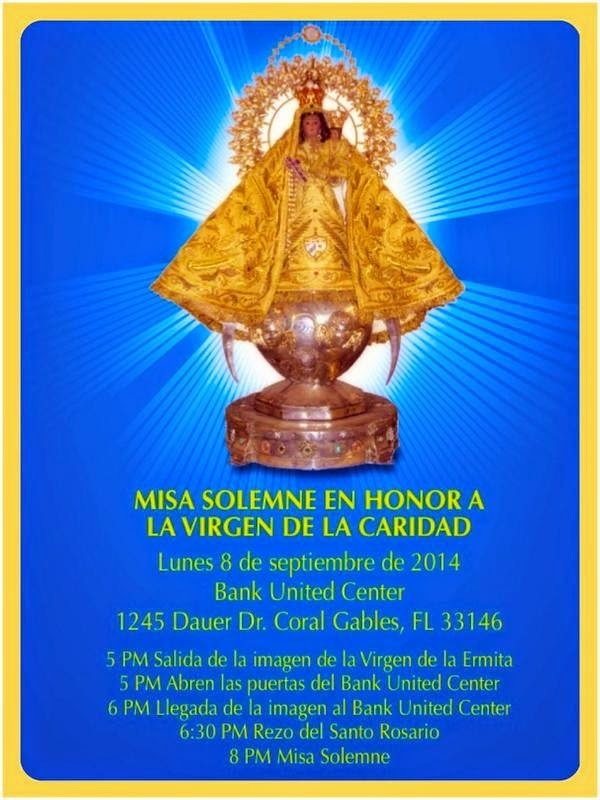 However at the beginning of the Mass Father Rumin of Ermita de la Caridad (Chapel of Charity) said "Hear this: You can not be a devotee of the Virgin of Charity Charity live without," reported Rosa Maria Payá over twitter. 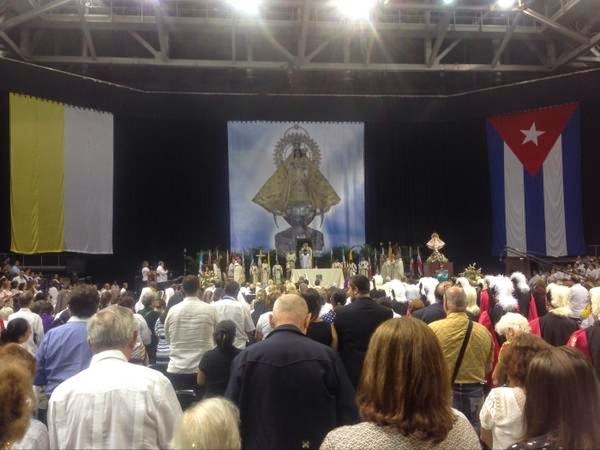 Over twitter Rosa Maria Payá observed: "the Church looks again at Cuba, Pope Francis sends letter to Cuba for Cobre Virgen of Charity celebration." In a second tweet she summarizes: "The Pope tells us we can not remain arms drooping bemoaning or passing the buck to others to do what is our own responsibility." Pope Francis on Monday sent a letter to Archbishop Dionisio Garcia Ibanez of Santiago, Cuba encouraging Cuban Catholics to remain steadfast in their devotion to the Virgin Mary and highlighted three virtues: joy, service and perseverance. It appears that what Pope Francis is calling for came into existence in a neighborhood of the Cerro 26 years ago and continues to steadfastly follow the way of love and nonviolence in confronting injustice. 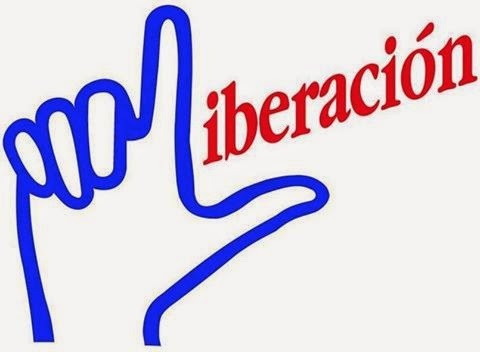 Regis Iglesias, a former prisoner of conscience and movement spokesman, posted the above Christian Liberation Movement logo along with the following message: "Happy XXVI Anniversary to all our brothers and sisters of the Christian Liberation Movement !!! 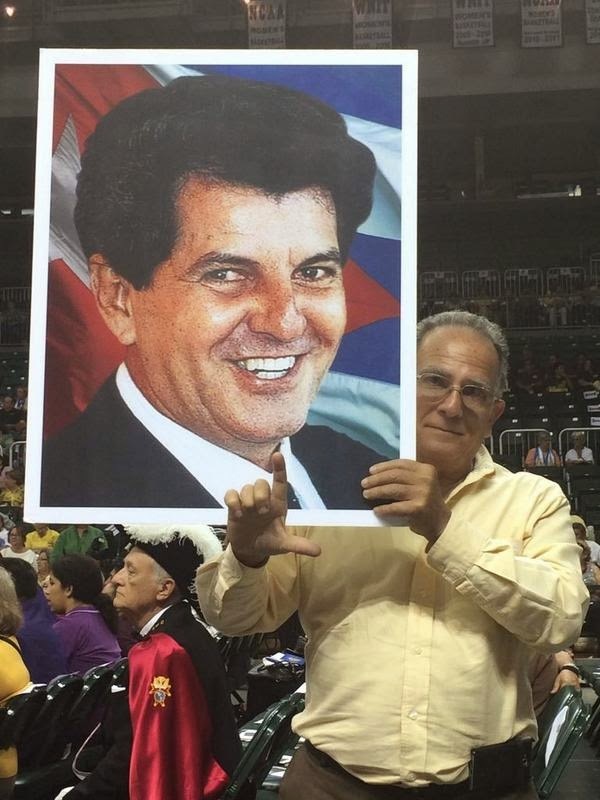 We continue on with our Love of Cuba and our commitment to our Martyrs !!!" The full text of Pope Francis' letter is reproduced below. A few days ago, the venerated image of Our Lady of Charity of El Cobre was placed in the Vatican Gardens. Its presence constitutes a moving reminder of the affection and vitality of the pilgrim Church of those luminous lands of the Carribbean which, for mor than four centuries, has addressed the Mother of God with that beautiful title. From the mountains of El Cobre, and now from the See of Peter, that small and blessed figure of Mary magnifies the souls of those who invoke her with devotion, as She leads us to Jesus, her divine Son. Today as we fervently celebrate the feast of Mary Most Holy, la Virgen Mambisa¸ I join all Cubans who set their eyes on her Immaculate Heart to pray for favors, to commend to her their loved ones and to imitate her in her humility and devotion to Christ, of whose disciples she was the first and greatest. Every time I read the Sacred Scriptures in the passages that speak of Our Lady, three words stand out to me. I would like to focus on them in order to invite the pastors and faithful of Cuba to put them into practice. The first is rejoice. It was the first word the Archangel Gabriel addressed to the Virgin. “Rejoice, full of grace, the Lord is with you” (Lk 1:28). The life of she who has discovered Jesus is filled with such great interior joy that nothing or no one can take it from her. Christ gives to his own the necessary strength to not be sad or overwhelmed by thinking about the problems that cannot be solved. Sustained by this truth, the Christian does not doubt that that which is done with love engenders serene joy, the sister of that hope which breaks the wall of fear and opens the doors to a future of promise. “I am Our Lady of Charity,” was what the three Johns read on the tablet that was floating in the Bay of Nipe. How beautiful it would be if all Cubans, especially the young, could say the same: ‘I am a man or woman of charity:” I live to truly love, and thus not be trapped in the toxic spiral of eye for an eye, tooth for a tooth. What joy is felt by one who authentically loves, through daily acts, and who is not among those who are full of empty words that are carried away by the wind. The second word is arise. With Jesus in her womb, St. Luke says Mary arose and went with haste to serve her cousin Elizabeth, who in her old age was with child (cf. Lk 1:39-45). She fulfilled the will of God placing herself at the disposition of whoever needed her. She did not think of herself, she overcame all setbacks and gave of herself to others. The victory is for those who arise again and again without being discouraged. If we imitate Mary, we cannot just do nothing and merely complain, or perhaps pass the buck on to others for something that is our responsibility. Its not about doing great things but about doing them with tenderness and mercy. Mary was always with her people looking out for the little ones. She knew loneliness, poverty and exile, and she learned to create fraternity and to make her home in whatever place good would germinate. We implore her to make us poor in spirit, free of all pride, and to grant us a pure heart that sees God in the faces of the disadvantaged and patience that does not shrink from the difficulties of life. The third word is persevere. Mary, who had experienced God’s goodness, proclaimed the great things He had done for her (cf Lk 1:46-55). She did not trust in her own strength, but in God, whose love has no end. For this reason she remained with her Son, whom everyone had abandoned; she prayed without failing together with the apostles and the other disciples, lest they lose their soul (cf. Acts 1:14). We too are called to persevere in the love of God and to persevere in loving the others. In this world, in which eternal values are discarded and all is mutable, in which triumphs are used and thrown away, in which people seem to have a fear of lifelong commitments, the Virgin encourages us to be men and women constant in good works, maintaining his words, which are always faithful. And this is because we trust in God and we place in Him the center of our live and of those whom we love. We are to have joy, and share it with those around us. Lift up your heart and do not succumb in the face of adversities, persevere in the way of good; tirelessly helping those oppressed by sorrows and afflictions: these are the important lessons taught to us by Our Lady of Charity of El Cobre, useful both for today and for tomorrow. In her maternal hands I place the pastors, religious communities, and faithful of Cuba, so that She might encourage you in your evangelizing commitments and in your will to make love the foundation of society. Thus you will not be lacking in a joy for life, a soul for service, and perseverance in good works. To the children of the Church in Cuba I ask, please, pray for me, as I am in need of it. May Jesus bless you, and the Blessed Virgin care for you forever.